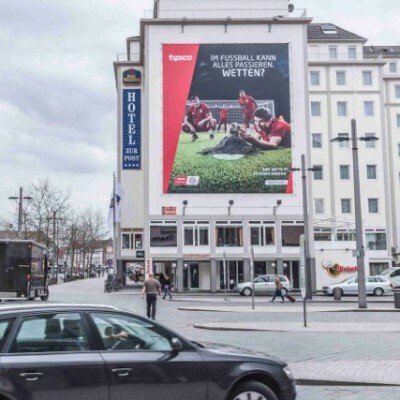 Sometimes, size does matter when it comes to outdoor advertising. Our blow-ups at top locations turn house walls and scaffolds into oversized advertising spaces. Hardly any other medium in the classical outdoor advertising reaches the urban target group this effectively. Our surfaces are always located at highly frequented locations and offer a lot of space for emotional communication. We offer a full service package for advertising companies: We produce giant posters with the highest material standards and have them installed by trained expert assembly teams, in consideration of all official regulations. After the XXL campaign, we store your motive subsequently up to six months.